If you are eating some healthy, fresh raw zucchini or even some lightly steamed zucchini drops on your shirt, there won't be much a problem. It's the other "stuff" we add to zucchini that can cause the difficult to remove stains. 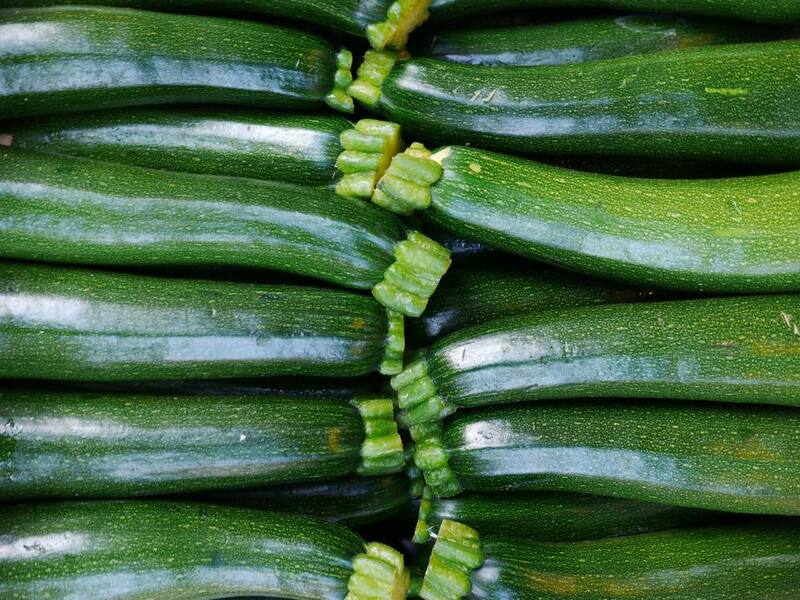 As soon as possible, use a dull knife or a spoon or even the edge of a credit card to remove any excess zucchini and/or sauce from your garment. If you rub the area with a napkin, it will only push the stain deeper into the fabric fibers. Then, as soon as possible, flush the stained area with cold water. Pretreat the stained area with a prewash stain remover like Shout or Resolve. If you don't have a stain remover, use a bit of heavy-duty laundry detergent like Tide, Wisk, Persil that contains enough of the stain-lifting enzymes that will cut through the stain. Allow the stain removal product to sit on the stained area for at least fifteen minutes and then wash as usual. Check the stained area before putting the garment in the dryer because high heat can set the stain. If the stain remains, repeat the treatment steps. If your zucchini was covered in a cheese sauce or oily salad dressing, you may need to follow even more steps to ensure the stain can be removed. If the garment is dry clean only, point out and identify the stain to your professional cleaner. If you are using a home dry cleaning kit, be sure to treat the stain with the provided stain remover before putting the garment in the dryer bag. When the zucchini hits the carpet, use that dull knife or credit card edge to lift away all the excess solids. Next, mix one tablespoon of dish washing liquid with two cups of warm water. Stir well to mix completely. Using a clean white cloth or paper towel, sponge the cleaning solution into the carpet fibers. Always work from the outside edge of the stain toward the center to prevent spreading the stain even larger. Next, use a clean dry cloth and blot the area until the solution is absorbed. Repeat the treatment steps a couple of times with the cleaning solution until the stain is removed. If the stain is not budging at all, create a new cleaning solution of one tablespoon of ammonia and two cups warm water. Follow the same sponging steps using the ammonia solution. Again, always work from the outside edge of the stain toward the center. Rinsing away any cleaning solution residue is the final step. It is important to remove all of the solution from the carpet because the soap can actually attract soil. Wet a clean white towel or paper towel with plain water and sponge to rinse away any soapy residue. Allow to air dry away from direct heat. Vacuum the stained area to lift the carpet fibers. For zucchini stains on most upholstery, follow the same cleaning method as for carpets but take extra care not to over-wet the fabric. If the upholstery fabric is silk or vintage, consult a professional cleaner or if you need more stain removal tips to prevent damaging the fabric.